Pics and Kicks: when you share you get more. when you share you get more. "I broke my binoculars in half and now we each have a telescope!" My brother painted this awesome dude on a piece of scratch paper when he was a teenager. We affectionately call him the acorn man. I've ALWAYS LOVED this drawing! I'd love a copy of it for Cole's room someday! I LOVE this picture! Gavin's art was amazing. I remember the other pictures with acorns that are just perfect for a story book. Gavin rocks! I just love this picture. So MUCH! perfect picture for this sweet post!! I LOVE LOVE LOVE this I want to write a story about him. What a prefect character for a children's book. 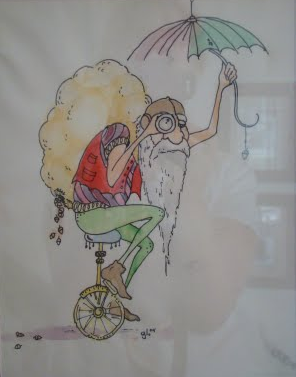 I really like the acorn man. Nat, you NEED to write a children's book using his art! Amazing!